It’s the perfect time to get outside and get healthy in San Diego! This month, you can walk for MS, plant a tree for Arbor Day, learn about healthy aging from experts, and enjoy the thrills and spills of the rodeo! Caregivers, home care aides and loved ones will enjoy these chances to volunteer, give back and sit on the edge of their seats this month in San Diego. Walk MS San Diego: Join more than 3,000 people this weekend in a three-mile walk along San Diego Bay. SDCCU hopes that last weekend’s walk and this weekend’s walk will raise a total of more than $1.5 million in donations. There’s no fee to walk, to walk ‘virtually’, or to volunteer. You can join a team, form a new team, or register as an individual. And now through May 12, all SDCCU branches in San Diego, Orange and Riverside will accept donations. Best of all, dogs are welcome, so take a nice walk and make everyone happy! When: April 21, 2018. Check-in begins at 7am, and the walk starts at 8am. Tickets: Price of entry is some elbow grease! The Fourth Annual Healthy Aging Conference: wellness-minded people of all ages are invited to the Fairbanks Ranch Country Club in Rancho Santa Fe on April 27. 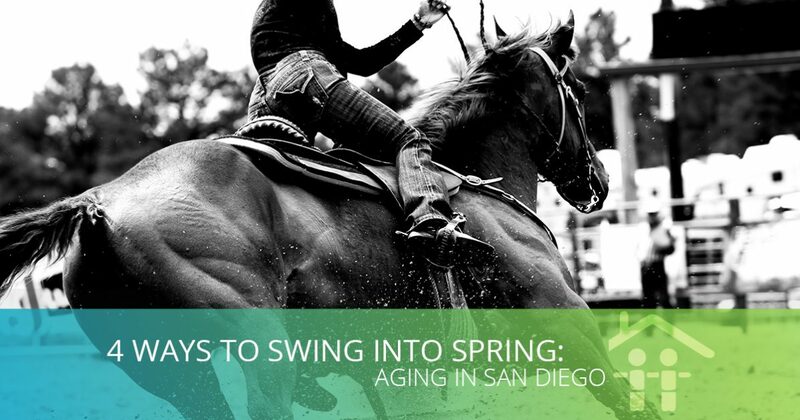 Sponsored by the Rancho Santa Fe Senior Center, the day will feature powerful and interesting speakers, a select group of local vendors, and lunch – all for just $30! Topics will include spirituality and aging, celebrating life, aging well, and healthy brain aging. No word on the menu. Tickets: $30 per person – includes lunch! The Lakeside Rodeo: Giddy-up to Lakeside April 27th -29th for the 54th Annual Lakeside Rodeo. Over three days in the Lakeside Rodeo grounds, you can watch the top-ranked U.S. rodeo contestants wrassle with the bulls. 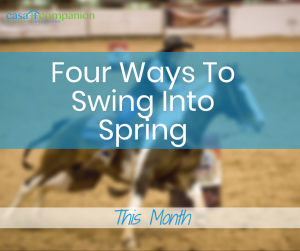 The seven competitive events include Bronc Riding, Bull Riding, Saddle Bronc Riding, Team Roping, Tie Down Roping, Steer Wrestling, and Barrel Racing. You don’t want to miss PRCA announcer Don Jesser, America’s favorite rodeo clown Kevin Higley, and both Miss Rodeo Lakeside and Junior Miss Rodeo Lakeside! Proceeds from all the fun will benefit arts and sports programs and education for Youth of Lakeside. And kids 4 to 6 can compete in the Kids’ Stick Horse Race [http://www.lakesiderodeo.com/p/about/281], where everyone’s a winner! Tickets: Choice Reserved are $20 all ages, General Reserved are adults (12+) $15 and children (2 – 11) $10. Purchase tickets with credit card (no Amex) by calling direct (619) 443-5125, between 10 AM and 6 PM. Or, purchase tickets using cash only at Boot Barn of El Cajon and Boot Barn of Kearny Mesa.